My parents had a saying: Stick your hand out too far, and it goes home in another car. My cousin is a big Ravens fan. This strip is a blatant troll. Leading cause of accidental amputation and decapitation. Haha, we got threatened similarly about the hands-out-window. It didn’t help that when he was a teenager, my dad was driving, my brother was in the front passenger seat with one foot on the windshield (why, dad??) and the other curled between the top of car and partially opened window, sleeping. Dad went to close the window, not realizing, and brother screamed and kicked and broke the windshield. And it’s nice that Ken realizes Heather’s having a rough time and is taking steps. You can almost hear when that dad’s heart skips a beat. Except when they make it so it takes an hour to drive a SINGLE! MOON! BLOOMING! CITY! BLOCK! 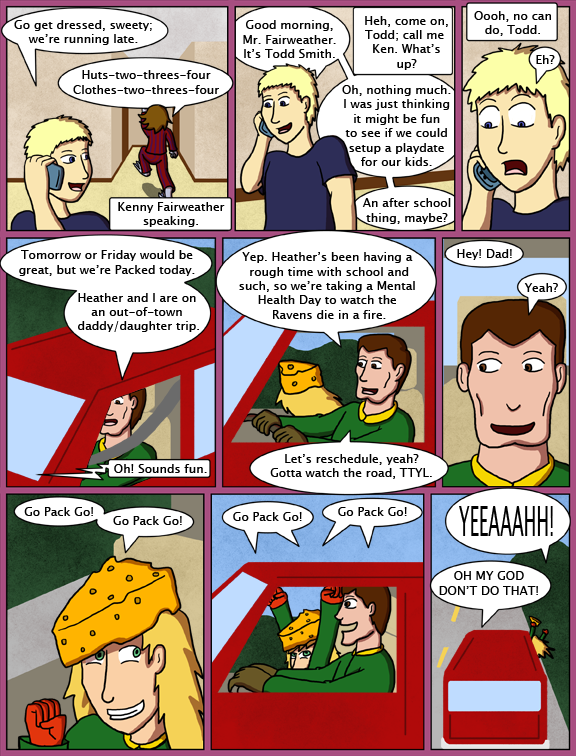 on the subject of Heather, i find myself curious if she was a Packers fan before adoption, or just ambivalent about American Football and now learning to love her parents passions. In Heather’s defense, she IS on the side of the road with no cars coming. Well, from all indications, Heather and Kenny Fairweather *are* Cheeseheads…so sticking body parts out of a moving car does seem a possibility. On my word! Kenny IS a cheesehead. . . don’t adoption agencies screen for that kind of thing? I’m from ND where all the good god fearing folks are Vikings fans, the ignorant are fans of some myriad of the other various teams, and the malefactor’s and the unholy follow the packers. I’m from the Twin Cities myself and you’d be surprised how many misguided folks are Packers fans. It makes me sad. He was clearly a Steelers fan in the first place, probably converted to make Heather happy. Did Mr. Fairweather take off his seatbelt between panels 4 and 5 and is Heather even wearing one?